(sorry, but my Memories are only possible to write in English, although I am a proud Portuguese born and bred woman, but it just has to be like this today). I have been meaning to write this post for a very, very long time but between this and that, there has just been no time. Period. Funny how life made a turn to make me have time to do it. It is funny how most of the time one has memories of people that have passed away. It is when you think of those people that you remember happy or sad days, images, feelings or things that have marked you. Sometimes it is the other way around. You see things that remind you of fond moments you passed with loved ones that are no longer here or that still are. Anyway, a memory is always about something that happened in the past. And in the past so many things happened that have set the way I am today! A year ago more less I attended an online course about blogging and the question I could never really answer was: what is the purpose of my blog. I don't want to sell anything thru it, I don't aim for greatness or a huge number of followers (although must admit wouldn't mind a few more). So it was with great surprise that this November, Life brought me the answer: she is the one I want to write about! You can say that I could do it in a diary, in a private book to be seen when I am gone by my children but no, this is how I want to do it. So, Miss Lacitos is about my life. Probably boring for most of my possible readers, intriguing for others but well, I do hope it will make you laugh or cry from time to time, inpire and amaze you here and there and just show you how a life, past and present, of a working mother of 4 children is. 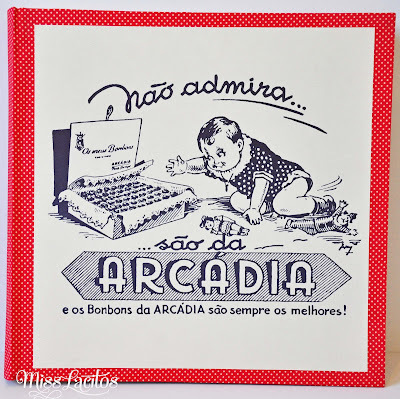 And today I want to share with you some memories that just came to me when my Mother gave me some pamphlets of a famous chocolate shop in Porto, the well-known Arcadia. 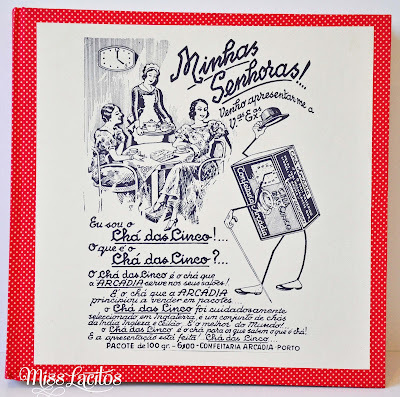 This chocolate shop, when I was little, existed just in Porto's downtown. There you could take a proper tea and of course eat their famous chocolates or buy them in blue boxes to bring home. I remember going there sometimes but I passed at their door countless days when I went to visit my grandfather that worked close by. He was: a not very tall, bald men, with a white moustache and most of the times a very serious look. I never really knew what he did but I always thought he most be important in his work because everyone treated him with respect. Every time I had a school break, I would get on the bus (I was probably 8 when this ritual of ours started) and go visit him on one of the days. We would meet at his office and then he would take me to a bookshop where he would buy me a book (he gave me most of the books I owned at the time). Then we would go to lunch at Bolhão's market, in a small restaurant under the stairs. I can still feel the smell of the place. After lunch I would go back to his office, stay with him for a while and then normally he would leave early and we would come back together or I would take the bus back home. Before I left he would always buy me a snack so I wouldn't get hungry coming home. He died 20 years ago but the grip of his hand on mine when we went to mass together and prayed Holly Father still brings tears to my eyes every Sunday when I do the same thing with my husband, children and parents. That small but strong hand held me many, many times. I was the only grandchild allowed into his office at Christmas and together we would prepare the bags and piles, separated by member of family or couple. I was also allowed to hear music with him because some how I had the ability to stay put and listen to Pavarotti while he played on his vinyl player. I know he was austere, he had a bad humur lots of times, but isn't it funny what your memory keeps? And isn't it even more funny how a piece of paper from a chocolate shop, now transformed into a big chain of shops, can trigger all these things? I have many more to share with you and they will for sure come know and then, triggered by this or that. Forgive me for the boredness of the facts but the world would be a so much better place if every child had has a hand like that to hold from time to time! And well I just really had to use those pamphlet's for something right? And (I know , I know, I just can't stop) because it is good to know what this home of mine is finally about, Miss Lacitos leaves you with a song about home that I just love! Have a nice weekend and I promise to be back Sunday with my week meal planner! O melhor post de sempre! Um beijo enorme amiga.